Chase Doors PerfaStrip PVC Strips - Standard Clear LOC-RIB Material | Hoover Fence Co.
Standard Clear Loc-Rib™ PerfaStrip Replacement Strips are bulk PVC rolls that are perforated and punched for easy installation. We make the job of replacing vinyl strip doors easier by offering pre-punched and perforated rolls of PVC Strip material. PerfaStrip is a continuous roll of PVC strip material that is pre-punched and perforated to your specified length. PerfaStrip strips make installation as easy as 1, 2, 3! Step 1 - Pull out one strip. Step 2 - Tear off of the roll at the perforation (Diagram). Material hangs flat right off of the roll. Punched strip fits most punched hole bracket styles, fits 1/4" bolts/studs spaced 1" or 2" on center. NOTE: Customer must note the exact length of the strips before ordering so that the perforations can be made. 8" Wide Roll 51 lbs. 12" Wide Roll 111 lbs. The most basic and economical barriers to separate two spaces are overlapping strips of clear or tinted flexible plastic known as PVC Strip Doors or Strip Curtains. The most common application for Strip Doors is as a secondary barrier where the primary door will be left open for extended periods to facilitate workflow. Another example of where PVC Strip Doors are used include cooler doors or freezer doors or even overhead dock doors where controlling environmental conditions such as heating, cooling or moisture will save energy and protect supplies and equipment. Vinyl Strip Curtains provide improve the traffic flow as they help speed the movement of your personnel or materials between two areas in your building by eliminating the stop, open, move through and manually close actions that a traditional door requires. Strip Curtains also provide protection against noise, wind and dirt therefore helping to provide a comfortable work environment for your employees. For cooler and freezer door applications Strip Curtains can reduce heater wear, reduce filter maintenance, reduce coil icing and assist in longer shelf life for refrigerated products. PVC Strip Doors and PVC Strip Curtains are easy to install, maintain and if necessary repair or replace. They are very versatile and can adapt to a wide range of applications. Our manufacturer offers the largest selection of PCV vinyl strip materials in the industry. Most of the items listed below are special order and can be ordered by using our Quote/Order Form (PDF). Loc-Rib Strips - Our standard and USDA grade PVC strips can be fabricated with "locking" ribs to seal against air flow in cooler or freezer temperatures. Ribs also preserve strip clarity by absorbing abrasions. Available in 8, 12 and 16 inch strips for door sizes up to 25 feet tall. Colored Strips with Clear Windows - Windows are added to attractive opaque colored strip doors by RF welding clear sections into the center of the strips. Available in black in black, blue, and green in 6, 8, or 12 inch strip widths. Safety Orange Edge Strips - Call attention to door edges with 8, 12, or 16 inch semi-transparent orange strips. Anti-Static Strips - Clear strip formulated to dissipate static electricity harmlessly away from personnel or sensitive equipment. Available in 8 or 12 inch strips widths. Amberweld Strips - Specially formulated to screen out UV and near UV rays from welding and brazing flash. Available in 8 and 12 inch strip widths. 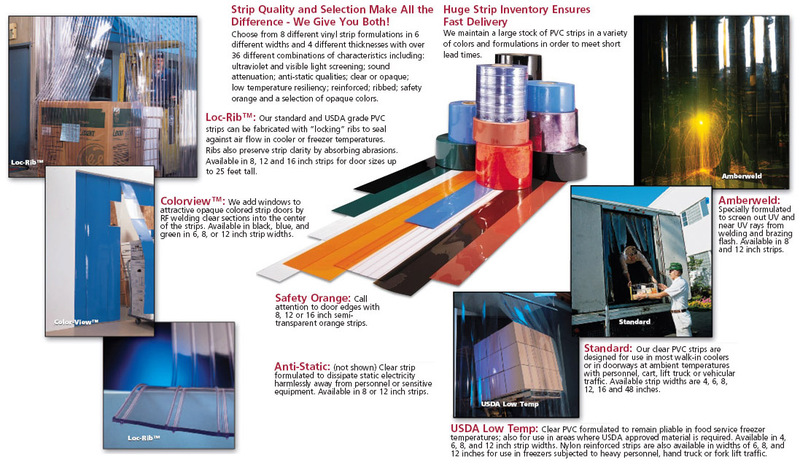 Standard Clear Smooth Strips - Our clear PVC strips are designed for use in most walk-in coolers or in doorways at ambient temperatures with personnel, cart, lift truck or vehicular traffic. Available strip widths are 4, 6, 8, 12, 16 and 48 inches. USDA Low Temp Strips - Clear PVC formulated to remain pliable in food service freezer temperatures; also for use in areas where USDA accepted material is required. Available in 4, 6, 8, and 12 inch strip widths. Nylon reinforced strips are also available in widths of 6, 8, and 12 inches for use in freezers subjected to heavy personnel, hand truck or fork lift traffic. 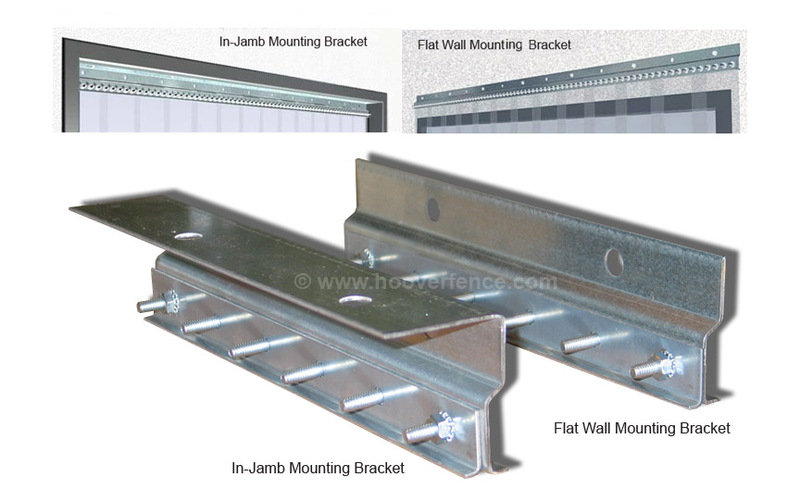 Standard brackets are the two most common bracket mounts used. They are the flat wall mount and the in-jamb mount (Example). Flat Wall Mount - Mounting method in which the strip door overlaps the opening in width and height. The Standard overlap in height and width is 6". Also called "face of wall" or "surface mount", this method requires clear, unobstructed wall space around the opening. The formed steel face plate holds strips firmly while allowing flex without breaking. These rugged brackets are constructed with 14 gauge galvanized steel with 1/4" studs. Face plates are formed in 12" sections for easy strip replacement. This bracket is the most popular design in the industry. Its simple strip replacement feature allows the customer to replace individual strips cut-to-size from the factory, or cut and punched in the field. In-Jamb Mount - Same as the above mount only this one mounts inside the jamb to the frame header so it does not take up any wall space. It can be mounted in conjunction with another door. 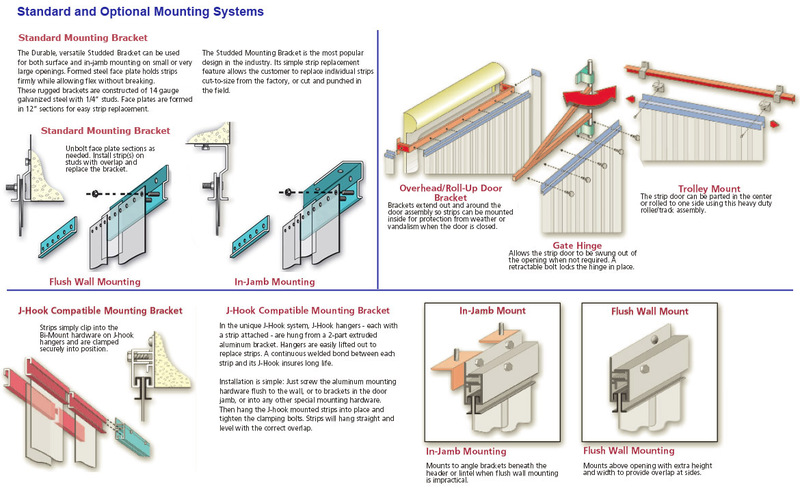 A strip curtain mounted in a jamb mount is ideal for openings closely surrounded by obstructions. J-Hook Compatible Mounting Bracket - In the unique J-Hook system, J-Hook hangers - each with a strip attached - are hung from a 2-part extruded aluminum bracket. Hangers are easily lifted out to replace vinyl strips. A continuous welded bond between each strip and its J-Hook insures long life. Installation is simple: Just screw the aluminum mounting hardware flush to the wall, or to brackets in the door jamb, or into any other special mounting hardware. Then hang the J-hook mounted strips into place and tighten the clamping bolts. PVC strips will hang straight and level with the correct overlap. Swing-Away Bracket - Consists of a single or bi-parting bracket that mounts to the face of the wall. The bracket is designed to swing away from the opening and out of the way. This strip door is manually opened and closed. A common application is a door that is used in cold weather, but not needed in warm weather. Gravity Return Bracket - This strip curtain mounts inside the jamb on gravity return hinges and swings open when impacted. The hinge is the same basic design as the flexible door gravity return hinge. Sliding Track Bracket - The hardware system consists of a box track and trolleys that attach to a strip door bracket. This design requires clearance next to the opening equal to the door system. Overhead Door Bracket - These are designed to fit around a garage door. The benefit to this design is it installs on an exterior door, but is inside the building where it isn't exposed to the weather. Overhead/Roll-Up Door Bracket - Brackets extend out and around the door assembly so vinyl strips can be mounted inside. This protects the material from weather or vandalism when the door is closed. Gate Hinge - Allows the strip door to be swung out of the opening when not required. A retractable bolt locks the hinge in place. Trolley Mount - The strip door can be parted in the center or rolled to one side using this heavy duty roller/track assembly. 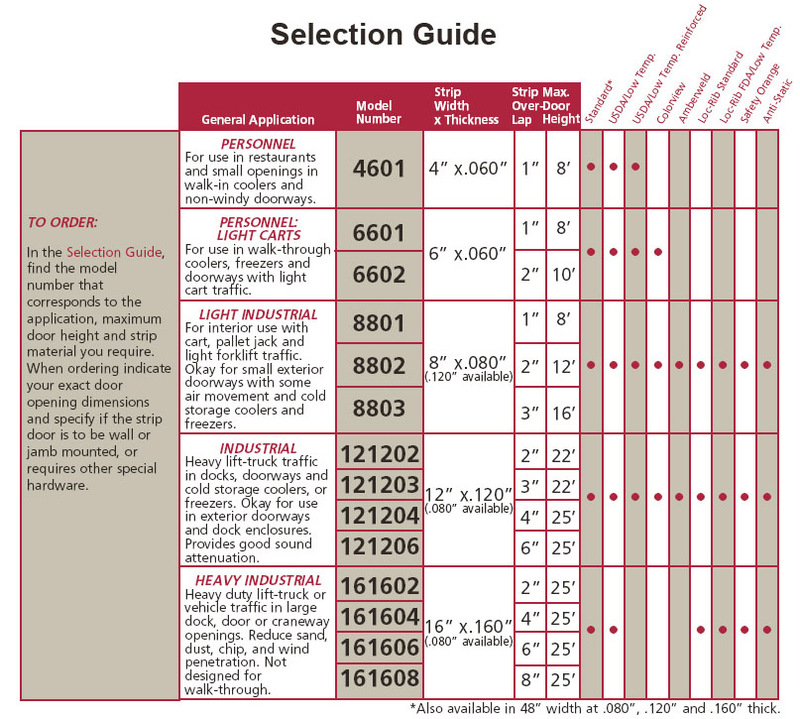 When ordering your strip curtain, indicate your exact door opening dimensions by measuring the opening width and height. Check for any obstructions near the opening that may affect the mounting of the strip door to the surface. Common obstructions are lights, switches, vents and drain lines from coils. If you choose wall mount, an additional 6 inches in height and a minimum of 4 inches in width will automatically be added to the door to cover the face of the opening. If obstructions are in the way please indicate when ordering to compensate for the difference. When ordering an In-Jamb mount strip door, the strip door size will be the same as the door opening size. The thickness refers to how dense the vinyl strip curtain material is. .060 - is the thinnest available material and is an excellent alternative for walk-in coolers. .080 - can be used with carts, pallet jacks and light forklift traffic. Okay in small exterior doorways with some air movement and cold storage coolers or freezers. .120 - can be used with heavy lift-truck traffic in docks, doorways and cold storage coolers or freezers. Okay for use in exterior doorways and dock enclosures. Provides good sound attenuation. .160 - can be used with heavy duty lift-truck or vehicle traffic in large dock, door or craneway openings. Reduce sand, dust, chip and wind penetration. Not designed for walk-through. When selecting material thickness, your choices will be limited according to the type of material and strip width that you choose. Personnel - Strip doors with people traffic should utilize smaller size strips with less overlap. Consider using 6" or 8" material with 33% to 67% overlap. Only use 4" material on very small openings with personnel only traffic. Keep in mind that smaller strips give less wind resistance and will not hold up as well under heavy forklift traffic. Pallet Trucks - Pallet truck traffic normally indicates that the door will get heavier traffic including pallets of material. Pallet trucks also typically have a person walking with the truck. Keep this in mind. If an opening has heavy pallet and personnel traffic, consider 6" material with 67% overlap, or 8" with 25% or 50% overlap. Forklift Traffic - Forklift traffic normally indicates heavy traffic with more abuse. 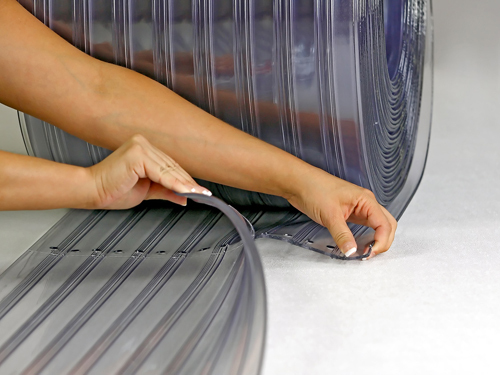 Larger PVC vinyl strip sizes should be considered with forklift traffic. Also consider the type of load the forklift is carrying as the strips will drag over the load. If the load is light, the larger strips may tend to drag product off of the load. 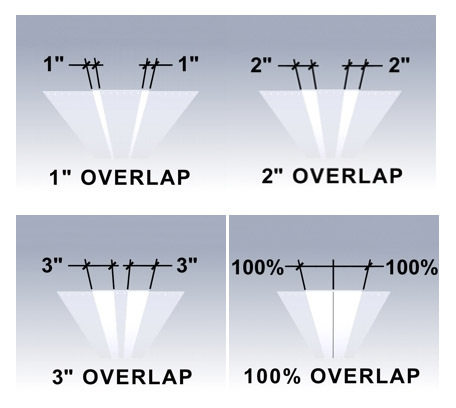 Consider 8" material with 50% to 100% overlap or 12" material with 25% to 50% overlap. If the opening is small in relation to the size of the load, you may want to consider smaller strips with less overlap as the strips are more prone to dragging over the load. For example, consider 8" material versus 12" material on a 96" high opening with an 84" high load. Always consider going to larger vinyl strips and/or more overlap for large openings or openings with draft conditions. 4" Personnel - For use in restaurants and small openings in walk-in coolers and non-windy doorways. 6" Personnel/Light Carts - For use in walk-through coolers, freezer and doorways with light cart traffic. 8" Light Industrial - For interior use with cart, pallet jack and light forklift traffic. Okay for small exterior doorways with some air movement and cold storage coolers and freezers. 12" Industrial - Heavy lift-truck traffic in docks, doorways and cold storage coolers or freezers. Okay for use in exterior doorways and dock enclosures. Provides good sound attenuation. 16" Heavy Industrial - Heavy duty lift-truck or vehicle traffic in large dock, door or craneway openings. Reduce sand, dust, chip and wind penetration. Not designed for walk-through.